One of the most important parts of life in the 1980s for me was my family. My dad passed away this past Oct. 12, 2015, and I thought it fitting to just publish the eulogy I wrote and my sister-in-law Candius Vogt so eloquently read at my dad's funeral. 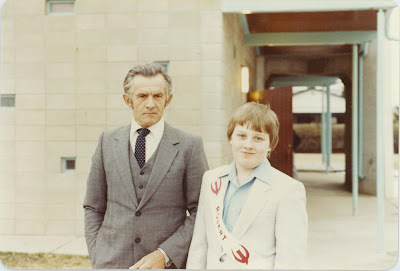 My dad and me at my Confirmation in Grade 7. Could my head get any bigger? Could my dad be anymore handsome? Paul Vogt was born on October 29, 1930, the son of Max and Anna Vogt, in Kleinpogel, Germany, a village of a few hundred people not far from the Oder River, where he often played as a boy. He was the first son, born after his sisters Clara, who died after a few months, Irmgard, and Maria. After him came his brother, and best friend, Bernard, followed by sisters Barbara and Monica. When he started school, he had to walk a few kilometers to a nearby village. He enjoyed school and athletics, and was pretty good at both. One year, he qualified for a district track meet in both the 100-metre dash and the long jump, but could only choose one. He chose the dash, while his friend chose the long jump. Their school ended up winning both events. However, he did regret not being able to go to school longer. Paul was Roman Catholic, and his faith was important to him. He went to church regularly and took his kids to mass every Sunday too, whether they liked it or not. When he talked about his own upbringing, a source of pride was his confirmation, where he, Irmgard, Maria, and Bernard, were all confirmed by Adolf Bertram, the Cardinal of Breslau. In 1939, Paul watched the German army march through his village on their way to invade Poland. That started the Second World War, which threw the entire world into turmoil. The war did not affect life too much at first. Once his father was taken into the German army though, Paul had to take on greater responsibility helping his mother to run the farm. One weekend, his mother was visiting his father at the front, when Opa Vogt told her to take the family and head west. The Russians were coming. She packed up her family and they left, while the rest of the family stayed behind. Ultimately, the Vogts would become Displaced Persons and trek 1,500 miles until they landed in western Germany. Once they settled again, Paul would find work from local farmers, then later in the coal mine near the Dutch border. Along the way he enjoyed his first Oktoberfest, before he and his family made the decision to immigrate to Canada. The Vogt family landed in Canada in 1954, where they would work in the sugar beet fields near Picture Butte. In the off-season he, and brother Bernard, looked for work in Calgary, where they often found something in construction. One of the cool things to do in the ’50s was go dancing at the German-Canadian Club in Calgary. It was there in 1956 that Bernard set Paul up with a young, beautiful German woman named Alice Jetz. By 1957, the Vogt family had bought a farm near Brooks. Paul, his parents, brother and two sisters had all migrated to Brooks with the family. Two years later Paul and Alice were married in January of 1959 and in November their first child George was born. In October of 1960 Paul and Alice, along with Paul’s parents, and brother and his wife, became Canadian citizens. It was a very important day, so much so they made the front page of the Brooks Bulletin newspaper! At that point Alice was pregnant again, and had a daughter, Barbara, in January of 1961. Paul and Alice decided it was time to make their own mark on the world, moving to the Coaldale area in 1964. Eventually, they settled on a place six miles north and 1.5 miles west of Coaldale, where they had a mixed farm of sugar beets, wheat, barley, hogs, and chickens. In February of 1970, their youngest son Robert was born. George would move off to college in Calgary. George met me and when it was time to meet his parents, dad welcomed me into the family with open arms. I have felt his kindness and love ever since then, and that’s been 35 years. Paul and Alice would continue to farm together until 1991 when they decided to lease the farm, and retire into Lethbridge. They began a whole new, different life in the city. No longer burdened with the stresses of farming, dad underwent a transformation, from farmer and provider to more of a family man. He enjoyed spending time with his two grandchildren Jessica and James. Then, when Barb got married and had two girls of her own, Chelsea and Megan, he played a role in their lives, driving them to and from school every day, and going to every recital and concert he was invited to. By then George and his family had moved to Nanaimo, and mom and dad started making regular trips to the island. Dad enjoyed watching his grandchildren play sports, like basketball and soccer. As the years went on, Jessica married Jeff, and dad was thrilled to go out there for the celebration. Just last month Chelsea got married, and dad was happy to spend time with relatives, and welcome Chelsea’s husband Shadow to the family. Through all that, he never stopped being a dad to his children. He and mom welcomed their son Rob back home to live when he was between jobs, then going to college to start a new career. When Barb was injured in a fall, dad and mom helped her get back on her feet. The family always tried to stay connected. George and Candius visited at least once a year, but more often two and three times a year to spend a week with dad and mom. Dad always looked forward to their visits. A tradition that grew over time was Sunday afternoon coffee, where Barb visited every Sunday, and Rob came when he could. Dad was an honest, hard-working man. He had a lot of integrity. People in our family said if you wanted a job done right, you went to Paul. He always wanted to be fair in whatever he did too, whether it was the way he treated his family, or dealt with others. In his last days, he was talking about his care, especially from the nurses. He said they were excellent, but you have to be nice to them and they will be nice to you. I think that’s a pretty good way to live your life generally. Dad loved to read, go for long walks, work in his yard, and religiously watch his game shows, including The Price Is Right, which was a passion for more than 30 years. He also loved to talk about politics. Voting was important to him. He voted in the first post-war free elections in Germany, and in every federal election after moving to Canada. It is ironic that today is election day. I’m sure dad is up there giving an earful to some of the politicians he never agreed with – so watch out Ralph Klein. More likely he’s up there with his brother Bernard and his brother-in-law Witold and they’re talking about farming.